What do people say about Diversified Plus Exteriors? Every time I drive up to my house i am so pleased with the results of my new James Hardie siding. It gave my house a much needed lift. It's clean, fresh and looks amazing. My house is also a lot warmer this winter as a lot of the drafts have been fixed. I am looking forward to installing some new windows this spring. I will be using Diversified Plus for this job as well. The job ran very smoothly and quickly. Mr. Jack Ricotta was a pleasure to work with. I would recommend Diversified Plus to anyone considering construction work. I was also very impressed with the professionalism of the crew. 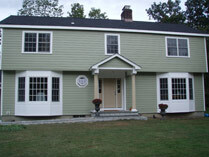 Diversified Plus installed James Hardie shingle siding on our house in Oct of 2010. When all of our neighbors came by for Halloween, everyone remarked how amazing the house looked - how it looked brand new! We have had some negative experiences with contractors in the past, however Diversified Plus was a totally positive experience for us. The workers arrived on time every day, and made sure to clean up after themselves daily. Jack was always available to answer questions, and went out of his way to address all of our concerns. 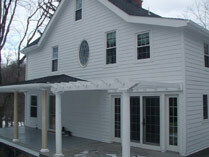 The house looks spectacular (it no longer looks haunted), and we are 100% satisfied customers. We would recommend Diversified Plus in an instant, and are looking forward to completing future projects with Jack and the Diversified team. My wife and I chose James Hardie siding for our home remodel and Diversified for the installation and could not be happier with our choices. The product is beautiful and durable and a great value for the money. We have received nothing but compliments on our project. For installation, we recommend Diversified without reservation to anyone looking to re-side and in fact have already done so. We found Jack honest, straightforward and reliable (with very competitive pricing), we got what we agreed to on time and on budget, and his crew was efficient and meticulous in their worksmanship. We would use Diversified again for home projects without hesitation. 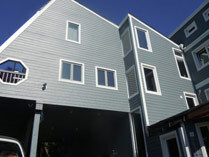 Siding was part of a large addition/renovation project contracted with Diversified Plus. 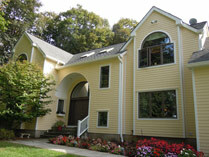 James Hardie siding was specified by our architect. After researching many other siding options we opted for ColorPlus Cedarmill planks with matching trim in Monterey Taupe. In addition to the listed properties one of the most influential was instant gratification. Once it is installed it is done! No additional priming or painting was required. We are very satisfied with the finished look of the product and the excellent workmanship of Jack's team.